5 nights here for my partners 40th with no kids was a great wee break. Unfortunately the bus took 3 hours from the airport! Hotel food and drink was great while we stayed here. Rooms basic but just somewhere to sleep for us. Entertainment was ok more for the kids. Entertainment team ask you to join games but fine if you don't want to. Wi-Fi was great 15 euro for a week can use anywhere in the hotel. Hotel tip: We had room 331 which was fine. Hotel rooms were a good size but don’t get one on the front of the hotel, as when you go on balcony it’s really windy. Pools are clean and of good size. Food, if you don’t like pork, don’t go because it was on every day. Head member of entertainment staff was very rude but the others were fine. Breakfast was sausage one morning and bacon the next never both together. Good job I liked cheese and ham baguettes, because that’s what I had for dinner and tea for the week. Would not go here again. Best thing about this holiday was the lovely couple we meet there. The hotel rooms are a good size and in our opinion excellent value. The food is also of a high standard and there is a wide choice to suit all. The staff are all very friendly and extremely helpful (the animation team in particular work their socks off to keep everyone entertained). The hotel's two pools are both a good size and kept very clean. This was our second visit to this hotel. Last year we went in August and found it incredibly busy with pools overflowing with children & lilos. This year we left it until the 17th of September to travel and, with temperatures still 28-30 degrees and the animation team still in full swing, we found the hotel much more relaxed and enjoyable for us (a couple traveling without children). Me and a friend booked this holiday about a month before departure just to get away for a week, we had no complaints. It was a beautiful room with a beautiful view from the balcony. Free ice cream, slushies, plenty of food even though there was not much variety of food, but there was plenty. Staff were very friendly and were a laugh and we got along with them all. The train to the beach was not always reliable, when we were going to go back, the train had broken down so we had to ask a different hotel to call us a taxi. On the last night, we went out for the only time to a small English pub called the 3 lions; it was a great night, very lively. We did not feel the need to go out the other nights, we usually jut carried some drinks too the balcony and sat there. The evening entertainment was a bit out of our taste but I would recommend the entertainment for families especially with young children. It was nice that one pool was too deep for children so during the day it was peaceful for us to just relax by the pool. 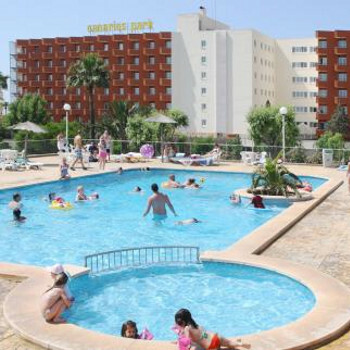 We would definitely visit this hotel again, was an amazing week, we wanted to stay longer, but be prepared to pay for sunbeds, total rip off! Just got back from a break at the hotel Canarios park in Mallorca , 06/10/2010, we went for one week, which with 4 adults and a 2 year old was an ideal length of time to stay. The room was basic but kept clean daily. The food was also basic but plentiful and good English choice, which with one of our party only eating potatoes and chicken anyway was a godsend the rest of us found the menu somewhat limited but we found something to eat every meal time and believe me you can eat virtually all day long if you desire. The all-inclusive was exactly that drinks served till midnight, self-serve slush and ice cream for the children. The towels were changed daily the bedding weekly, but we had no air con or fridge in room but the huge fan was very good. The downside to us was the staff we found that however pleasant we tried to be all the local staff were rarely smiling and let down a very reasonable hotel, with the exception of the 2 male caterers (sorry didn’t get their names) and the animation team that is. Wasps were about but not as bad as I expected but could be time of year, Wife was still thrashing her arms about and screaming at them! Overall a good value bargain holiday! My husband & I booked this through teletext on an allocated on arrival arrangement. We like Majorca and have been four times to different place, this was our first visit to Calas de Mallorca. The hotel is 20 minutes walk to the centre of a small town. We enjoyed the walk but usually got a taxi back in the evenings as the road was badly lit and quiet. The food was good, plenty of choice but I would think maybe a bit repetative if you stayed longer than a week. Restaurant clean and staff always tidying up. We never waited for a table. The entertainment was directed at families and as such did not appeal to us at all. I think families, especially with young children, would find it good. We went out most nights into the town and visited bars there. There were two small lifts, but as we were on the second floor it was not a problem. I should think if you were higher up the wait would be quite bad. We were given a room on the ground floor when we arrived which was directly over the stage and a pool. The noise was dreadful but we asked to be moved the next day which we were given quickly and with no problem. The hotel was good for families but not for us! Booked a last minute holiday to Majorca at the beginning of August as we were fed up with British weather and had planned to go camping. We were originally booed in the Hotel Samoa only to be told at 6am in the morning there was no room at the Inn! We were sent up to the Canarios Park by taxi although not happy about the situation. However, after a bit of a kip we took stock of the situation and made best of the new arrangement. To our surprise this hotel was a nice alternative and some other friends we travelled with were also staying here. I would say the food was very good and plenty of variety on offer. The restaurant had air conditioning and was frequently cleaned. We mainly used the top pool rather than the other one which was quite deep, as most of the sports/games were organized from here. It was great to chill out and have a craic with the other guests when it came to archery, pistol shooting, French boules etc. Me and my daughter even picked up a diploma each for finishing 2nd! The rooms were a bit cramped and the lifts were a bit of a lottery if working or not. Although no air con in our room we were on the 6th floor and the wind blew in from time to time to give us a breeze. The entertainment revolved around mini disco, then bingo and then whatever the Team put on after that. Lets say some evenings is was a bit dire and that they would struggle to get past the auditions on BGT. More fun though when the guests took part on other nights. Apart from an ear infection i picked up probably from the pool, we had wall to wall sunshine and had a brill time. We would go back to this hotel and we even checked out the Samoa again, which seemed a bit too lively for our liking. The resort isn`t that big so although the hotel is out on a limb a little bit, it made a change to catch the train down to the beach or even walk the 20 minutes into the small resort. Great for kids and familys and value for money. On the whole the food at the hotel was ok. Breakfast was good but there was a bottleneck at the toasters. (only 2) Scrambled eggs were poor but rest ok. Lunch was ok and dinner there was a good choice, especially if you liked pork! Choice of meats every night mainly pork, veal,and chicken. Pizza every night and good selection of salads. The rooms were clean but no air conditioning. The location of the hotel was very poor and to get into town you really need to get a taxi. Entertainment mostly aimed at kids under 10 and the adult entertaintment was poor. Music played round the pool during the day but mostly 70's and 80's played. If you like the beatles and abba you will love it. We wouldnt go again because of the location but if you just want to laze around the pool all day then dont worry. The hotel was relativly clean and tidy. The rooms were adequate for our needs. The main problem with this hotel is sound! It travels along the corridors very easily at night. It only takes someone to have a drunk conversation at one end of the corridor for it to wake up the entire floor. I used to ignore it as the people complaining to the noisemakers were usually making more noise than the original source. The tennis courts were good, we played every day 9-10 before it got too hot. The crazy golf was a way to kill 30 mins in the day. The bar service in the day was excellent, night time was the only time you queued for a drink but it was never for long. The food was ok. I always found something to eat and we always found a clean table for 4. However, If I had to stay 2 weeks then I would think it would get a bit repetetive. The Hotel staff were helpful and friendly, it was the bar staff who were rude, We arrived back to the Hotel at 11 45 pm and they refused us drinks. It was a hot night and they should have been serving until midnight, all we wanted was coke. The entertainment was ok if you like bingo and junior discos, nothing else only really loud music plating into the night. Hotel was noisy, you could hear everyones conversations. Food was awful and repetative, what was left ffom luch you were given for tea, it was not hot either, the only good thing was the bread.